Wrapping it up-- in style! Christmas came early on Dec. 4 as “Sandy Claus” Fink and her hearty elves filled a large corner of The Lincoln Center biggest ballroom to gather gifts for needy students and families at Holmes Elementary. Tarps filled bags of gifts as Spokane-North closed its “45 for $45” campaign, providing gifts totaling $45 for each of the 45 family members identified by Holmes teachers and administrators. Trucks, cars and SUVs substituted for sleighs as the crew hauled the huge assortment of gifts to Holmes to store until the holidays, continuing a decades-long tradition of helping the West Central families. Happy Holidays: Eighth-graders from Glover Middle School will sing carols at the club’s Christmas luncheon Dec. 11. Spouses are welcomed and club President Chad Haverkamp urged those not yet signed up for the event to let him know ASAP. Thanks to Tim Zacharias and Dave Petersen for volunteering at attend the Holmes Golden Hero Assembly on Friday, Dec. 15 at 1:30pm. After the party and the Dec. 18 meeting, featuring Spokesman-Review Editor Rob Curley, the club luncheons, after the holidays, will move Jan. 8 to Nectar Wine & Beer shop in Kendall Yards at 1331 W. Summit Parkway. But the Spokane River is a constant in the region, and the reason tribes and settlers located here. So the river is an apt tie-in for developments already established and future economic dreams. 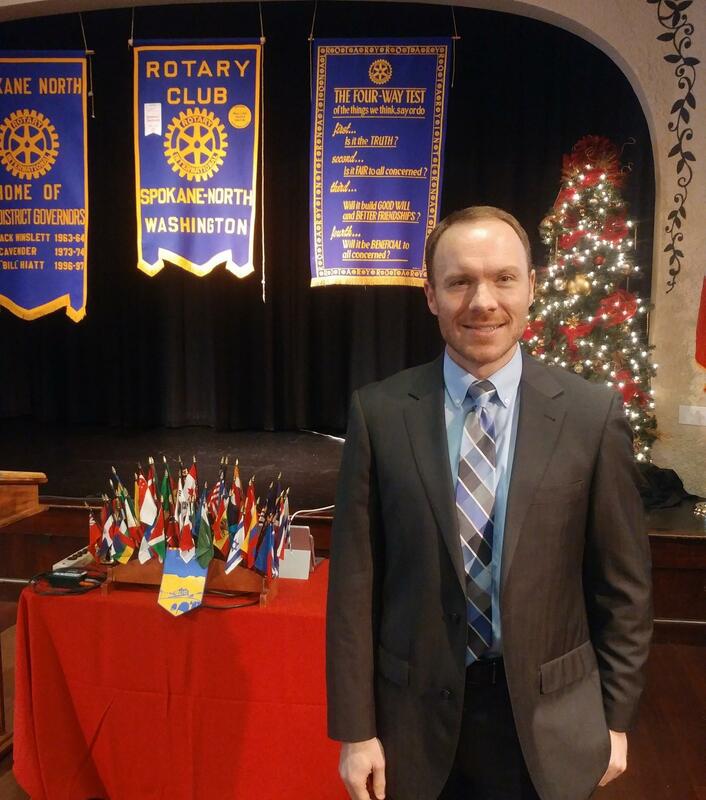 Gilberts detailed the plans at the Dec. 4 club luncheon. Gilberts, the U-District CEO, came to the position from his position as United Way’s Florida Statewide Director. It was a circuitous route, starting with his native Clayton, Wash., (“they made bricks there”) and relocating to Kellogg, as his dad worked for Dave Smith autos. The U-District, he stresses, creates a wider swath than the multi-school Riverpoint campus. Gilberts traces the U-District economic to Expo ’74 and the 1987 Momentum plan, which continued that effort for 10 years or more. Achieve sustainable and highest/best use of the land and river. Engage higher education institutions in collaborative economic development. Support business by fostering entrepreneurship and innovation. Increase meaningful and measurable opportunities for students, residents and employees. “We don’t need more plans; we need to get some things done,” Gilberts said. A 23-member board from government, business and education directs the U-District effort. One typical key for growth is Avista’s mixed-business six-acre development near East Sprague and spanning (next year, he hopes) the University District Gateway Bridge over Martin Luther King Ave. (formerly East Riverside) connecting Riverpoint. Another welcomed addition will be the stylish Central Line bus transit which will cross Browne’s Addition to Spokane Community College (and the North Corridor freeway).